Curious about that secret announcement earlier this week that hinted Forza Horizon was suddenly going to get a lot more interesting? Thanks to an an early leak we know it's an expansion pack that will add two new cars and 1000 new challenges. Oh, and it's free. If all you care about is finishing a game as quickly as possible, then Forza Horizon is going to last about as long as most of your sexual experiences. By ignoring the street race challenges, barn finds, and special races, you can skip straight through to the main event and complete the game in an afternoon. If you do that, you're missing the fun of all the smaller races (many of which are better than the actual races). In response to this, Turn10/Playground is adding a challenge-per-car such as using a Raptor to crash through as many objects as possible, or jumping an Evo over a golf course. 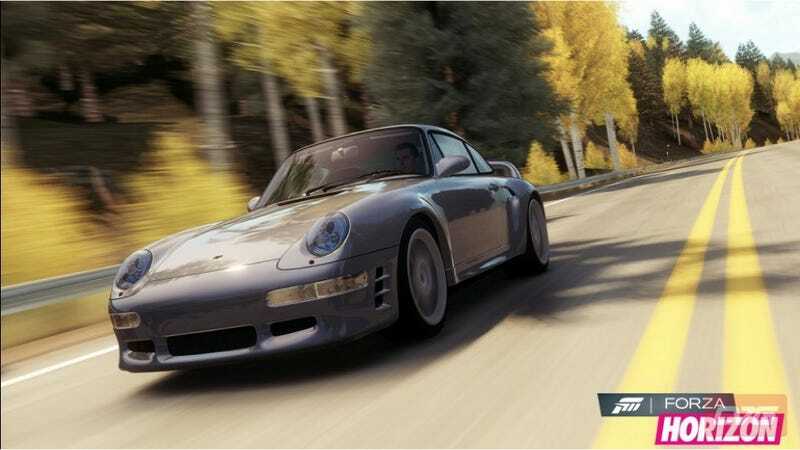 Plus, after all the complaints over the company shortchanging the players with DLCs full of cars you can get in previous Forza games (except for the perfect Jalopnik DLC), the people behind the game are apparently giving it out for free and throwing in the 1995 RUF CTR2 (essentially a modified 993) and a 1956 F100. As someone who just hit the "you've driven every road" mark, I'm thinking this is well timed. We'll see on Tuesday if this is how it goes.